The first successful measurements of the speed of sound in water were not made until the early 1800s. Using a long tube to listen underwater, as suggested by da Vinci, scientists in 1826 recorded how fast the sound of a submerged bell traveled across Lake Geneva. Colladon and Sturm measured the water temperature in the lake to be 8° centigrade. At this temperature, they determined the speed of sound in fresh water to be 1435 meters per second, which differs from the currently accepted value by only 3 meters per second. Their published results also reported earlier measurements in sea water made in 1820 near Marseilles by François Sulpice Beudant, a French physicist. Beudant’s measurements averaged about 1500 meters per second, approximate results expected for sea water. The measurements made with lowered lines were called “depth soundings,” (although they were not made using sound), to reflect the fact that the depth markings on the lines were called out as the lines were lowered. For example, the call “By the mark, twain!” by a leadsman lowering a weighted line on a Mississippi riverboat meant that the water was two (“twain”) fathoms or twelve feet deep and therefore, safe for the boat to pass (The American author, Mark Twain, always maintained that his primary pen name came from his years working on Mississippi riverboats – Twain was born Samuel Langhorne Clemens). At about this same time, scientists began to think about the practical applications of underwater sound. 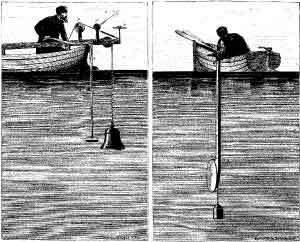 One of the first applications that scientists explored was to determine the depth of the sea by listening for echos. At the time, water depth was measured by lowering a weighted line from the deck of a ship, which is tedious, dangerous, and not very accurate. In 1838, Charles Bonnycastle performed the first known echo sounding experiments. In 1859, Lt. Matthew Fontaine Maury, commander of the U.S. Navy Depot of Charts and Instruments, attempted, unsuccessfully, to use sound to measure the depth of the ocean. These experiments failed not because the idea was wrong, but because Lt. Maury did not use an underwater receiver to listen for the echo. Eventually, echo sounding became one of the most important applications of underwater sound. In 1877 and 1878, the British scientist John William Strut, also known as Lord Rayleigh, published The Theory of Sound, a two-volume work often regarded as marking the beginning of the modern study of acoustics. Lord Rayleigh was the first to formulate the wave equation, a mathematical means of describing sound waves that is the basis for all work on acoustics. His work set the stage for the development of the science and application of underwater acoustics in the twentieth century.